This is the next in a series of the original 6 Paw Patrol dogs. This is Skye. She is designed to portray a pilot. Skye is a cocker spaniel. 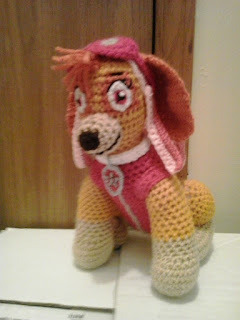 She, along with the other 5 Paw Patrol dogs, are a request from a co-worker. The others will be coming soon. Worsted weight yarn: Gold, buff, carrot, black, shocking pink, passion pink, coffee brown, gray, and baby pink. DMC floss: Shocking pink (600), black (310), and gray (415). Rds 5-8: sc in each sc around. (31) Change to shocking pink after Rd 8. BEGIN STUFFING BODY FIRMLY. CONTINUE STUFFING BODY FIRMLY AS YOU GO ALONG. Rd 30: (sc in next 3 sc, sc2tog) 4 times, sc in next 4 sc. (20) Change to gold. Finish off leaving a long tail. Weave tail through sc of Rd 48, pull tightly and secure. Weave in ends. Using gray, surface chain stitches up front of shocking pink section for zipper. Finish off leaving a long tail. Sew to BODY adding stuffing in MUZZLE before closing. Using black, embroider mouth on MUZZLE. Finish off leaving a long tail. Sew NOSE to MUZZLE. Using picture as guide, embroider EYES and EYEBROWS on SKYE. Rds 10-13: sc in each sc around. (16) Change to gold. Finish off leaving a long tail. Stuff FRONT LEGS firmly. Sew FRONT LEGS to BODY. Finish off leaving a long tail. Sew SLEEVES to BODY covering FRONT LEG attachment. BEGIN STUFFING HIND LEGS AT THIS POINT. STUFF LOWER PART OF LEG FIRMLY AND UPPER PART LIGHTLY SO THAT IT CAN BE FLATTENED. Finish off leaving a long tail. Flatten upper part of HIND LEGS and sew to BODY. Using graph above, floss, and Aida cloth, cross stitch MEDALLION. Rd 1: Attach gray crochet cotton and using Size 6 crochet hook in 6th sc of Rw 16, sc in evenly around outside edge with 2 sc in each of Rws 16 and 14 and 2 sc in center of foundation ch, slip st in first sc, ch 8, wrap around COLLAR, slip st in first sc of EDGING. Finish off. Weave in ends. Wrap COLLAR around neck of BODY and sew together. Finish off leaving a long tail. Stuff TAIL firmly. Sew TAIL to BODY. Finish off leaving a long tail. Sew PUP PACK SIDE WINGS to PUP PACK SIDES. Finish off leaving a long tail. Sew Rw 1 and Rw 32 together. Weave in ends. Finish off. Weave in ends. Repeat for second PUP PACK SIDE stuffing PUP PACK before closing. Rds 6-7: sc in each sc around. (40) Change to baby pink. Rw 1: With passion pink, ch 16, sc in second ch from hook and in each ch across. (15) Change to baby pink. Finish off leaving a long tail. Sew HAT TAILS to HAT. Finish off leaving a long tail. Sew EARS to BODY. Finish off. Sew GOOGLE LENS together using 4 sc. Finish off leaving a long tail. Sew GOOGLE STRAP to GOOGLE LENS. Place GOOGLES on SKYE and tack stitch in place. Fringe on 2 pieces of carrot in three consecutive Rds on forehead between HAT and EYEBROWS. Trim the yarn to desired length. Skye and Paw Patrol are copyright Spin Master Entertainment and their respective creators. This crochet pattern is an original pattern and is © by Christjan Bee (March 2018). Please do not claim this pattern as your own. If you wish to share this pattern, you may link to this pattern but please do not reprint/repost it on your site. You may print and keep a copy for your own personal use, but you may not sell or distribute it, or sell items made from this pattern.